John W. Simpson holds a unique distinction in the development of the atom as a source of energy for mankind. He is outstanding among engineers and scientists for significant contributions to all three pioneering applications of nuclear theory - to marine propulsion, to electric power generation and to space propulsion. The extent to which he influenced the transition from scientific discovery to practical application in all three areas is to a substantial degree responsible for the eminence of the United States in the atomic energy field today. Born 25 September 1914, in Glenn Springs, S. C., Simpson was graduated from the United States Naval Academy with a bachelor of science degree in engineering. He joined Westinghouse in 1937 and, by studying during his free time, earned a master's degree in electrical engineering from the University of Pittsburgh in 1941. He held various positions in the switchgear division at East Pittsburgh, Pa., between 1938 and 1949, and was instrumental in assuring that Westinghouse-supplied electrical switchboards and related equipment survived the extreme shocks and impacts aboard Navy vessels during World War II. In 1946, he was granted a two-year leave of absence by Westinghouse to work at Oak Ridge National Laboratory with a select group of engineers and scientists on a design concept that was the basis for the first attempt to apply nuclear energy to the controlled generation of power. Returning to Westinghouse, Simpson was named assistant manager of engineering for the Bettis Atomic Power Laboratory in 1949, operated by the company for the Atomic Energy Commission. It was at Bettis that the nuclear propulsion plants were designed and built under U.S. Government contracts for the USS George Washington, the first Polaris-carrying nuclear submarine, and the USS Long Beach and Enterprise, the first nuclear surface ships, as well as for the Nautilus. Simpson became assistant general manager of Bettis in 1952. Two years later, Westinghouse received a contract from the Atomic Energy Commission for the Shippingport nuclear reactor project, and Simpson was tapped as manager of the project. In 1955, with the Shippingport project well under way, he was named general manager of the Bettis laboratory. He was elected a Westinghouse vice president in 1958. A year later he was appointed general manager of the company's newly formed atomic power divisions, with the assignment of developing the company's then-modest commercial nuclear power plant activities. To get Westinghouse into the space reactor field, he also organized the company's astronuclear laboratory, which holds the first industrial contract for development of a reactor for nuclear rocket propulsion under the government's NERVA program. By 1962, the commercial nuclear power activities and the space reactor programs were proceeding smoothly, and Simpson was promoted to Westinghouse vice president for engineering and research. He was named vice president, electric utility group, in 1963. He was responsible for the activities of 18 major divisions that comprised the Power Systems organization, one of four company-like units that made up Westinghouse. In 1969 he was named president, Power Systems. He was in charge of the engineering, production and marketing of a wide range of electrical equipment for the utility industry and other heavy industrial and construction applications. He thus witnessed firsthand the growth of nuclear power that was spurred by the pioneering efforts at Shippingport. Simpson received the Westinghouse Order of Merit - the highest award the company makes to employees- for "his outstanding work in meeting the needs of the U.S. Navy for switchboards during World War II; for his talented contribution to the technical organization of the atomic power division; for his coordination and prosecution of the manifold technical details connected with the design and construction of the first sub- marine atomic power plant." 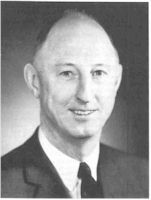 Simpson was named Pittsburgh's "Man of the Year in Engineering" by the Pittsburgh Jaycees in January, 1963, and was elected to the National Academy of Engineering in April, 1966. He was awarded the IEEE Edison Medal in 1971 "For sustained contributions to society through the development and engineering design of nuclear power systems." A member of the board of governors of the National Electric Manufacturers Association, he also serves as chairman of NEMA's power equipment division. He is a Fellow of the American Nuclear Society and has served on its board of directors, on its executive committee and as chairman of its finance committee. He also is a Fellow of the IEEE, and a member of the American Society of Mechanical Engineers, the Society of Naval Architects and Marine Engineering and the Atomic Industrial Forum. This page was last edited on 1 February 2016, at 19:21.